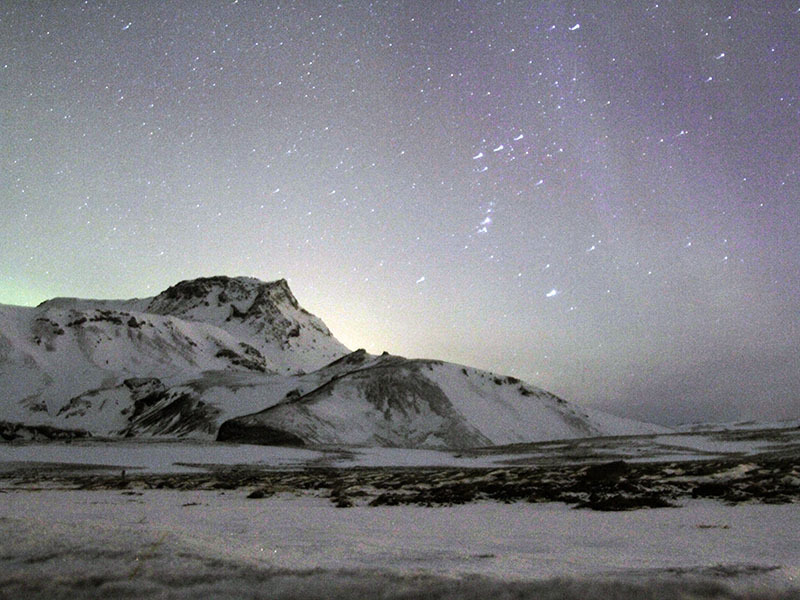 A lot of people journey to Iceland and unfortunately, do not get to see the northern lights. I guess I’m pretty lucky, as I’m not one of them. This narrative piece covers the second time I saw the lights, during a solar storm in Iceland. It remains one of the most awe-inspiring moments of my travels – hell, my life so far. We stood there, our fingers freezing in our gloves, our toes slowly going numb in our boots. Our gaze, directed to the heaves, our mouths agape as the sky around us exploded in a blaze of green and purple light. Ladies and gentlemen, planet earth presents, aurora borealis. We were witnessing the northern lights in Iceland. 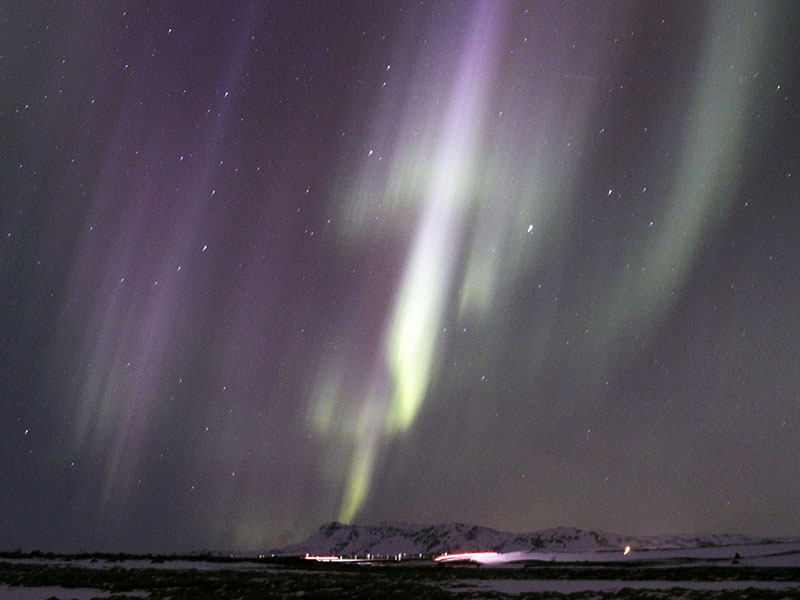 I have been lucky enough to have seen the northern lights once before… Nine months ago, on my first trip to Iceland. We were road tripping in the Westfjords, spending the night in a little town called Bíldudalur, in the middle of nowhere. My friend and I were sitting in front of my laptop, cracking up over an episode of “The Inbetweeners”. The front door of the hostel flew open and in ran a Frenchman, who was staying in our room. “The northern lights! The northern lights!” He screamed at us. We followed him as he rushed back outside. It had been raining all day, but finally now, at midnight, the clouds had parted. And there we saw it; a light green glow that spread across the night sky, as if they were being applied by hand with an invisible paintbrush. I have bared witness to some beautiful things in my life; the Great Barrier Reef, a stretch of endless desert in the night, sunrise over many oceans and red velvet cheesecake gelato – but this topped the list. Sometime later, burger in hand, I trekked down to the Harbour to meet my friends. R let out an exclamation of delight and pointed above me. I turned and looked up. And there they were, despite the light from the city and all odds. We took some photos and boarded the bus, which drove us away from Reykjavik, where we were able to snap more pictures. I was prepared for the event. I had a big DSLR that I barely know how to use and had purchased a tripod that at that time, was waiting for me in Atlanta, USA. I guess I can only say I tried. We then were gathered up by our guides, fed hot chocolate and doughnuts and taken even further out. Iceland is so sparsely populated, you only need to drive for half an hour to find yourself in the middle of nowhere. In any other country it might have been creepy, but not here. Never here. Off the bus, tripods were reassembled and the cameras positioned. It was at around 1130PM that the show really started. Light exploded from above our hands, fanning out from a centre point in the heavens, like the wings of a bird. All around us, everywhere we looked, they were there, spreading out across the sky. I try now to find the words to detail what it was like, but for once, words fail me. All I can say is it was the most beautiful thing I have ever seen. I instinctively went to raise my camera, but then stopped. I have a continuous internal battle raging inside my head, regarding whether taking a photo of an event constitutes actually being in the moment. I often feel as though living life through a lens causes you to inadvertently miss out on key events, leading you to experience them for half of what they actually are. And for what? A couple of photos that you are going to stick on Instagram or your blog, maybe show to a few friends or family members when you get home, before they sit on your hard drive from now until the end of time. R, who was stood next to me, grabbed my arm. My decision was made; I let the camera hang around my neck. I stood there, arm in arm with my friend, letting the cold of the night seep into me, while together, we watched Mother Nature put on a show. The next day we discovered that hours earlier, two blasts of magnetic plasma had shot out from the sun, causing a massive solar storm, one of the biggest in the last decade. 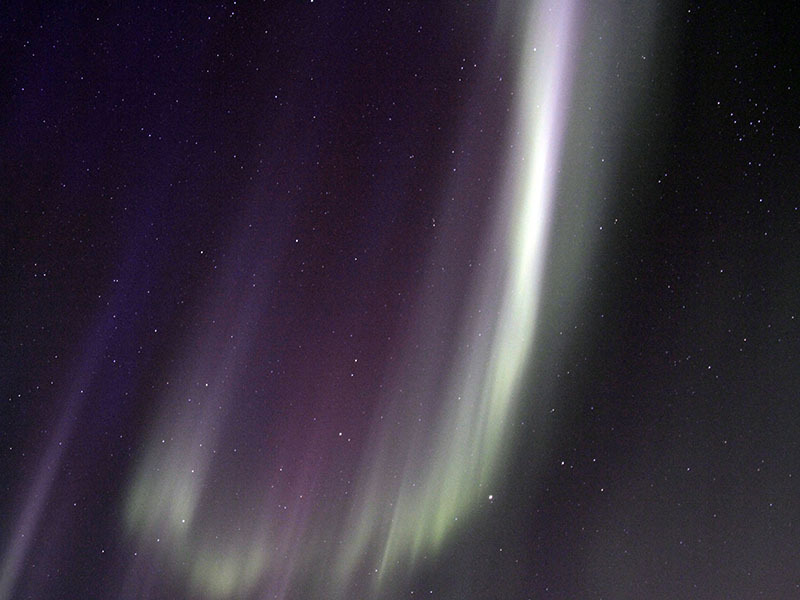 Aurora Australis had been in full swing down south and our lights had been viewable from the Scandinavian countries, Canada, Scotland and even parts of northern England. It was merely right place, right time, which as always in life, leads to the most happy of coincidences. Wow, Andrew I can only imagine how utterly mind blowing that would have been! I’m so glad your hard work paid off. Wow, so glad that I clicked the link in your Instagram bio! I am loving your blog, as I creep like 15 pages deep! Your travel photos and writing style are beautiful! Girl, you are too kind. Please creep away! Hope all is well with you.